Vision: Religion is a burning issue in Europe. Peaceful living together in a multireligious society is increasingly coming under pressure and we urgently need to deal with this. Knowledge of religious traditions helps us to reduce fear and anger because of prejudices and unfamiliarity with “the other”. Mission: ReIReS is a starting community of twelve European institutions that are building a unique and highly qualified infrastructure on religious studies. ReIReS brings knowledge into the field of religious pluralism in Europe, thus contributing to a stable society. It explains and implements the idea that “Knowledge Creates Understanding”. Innovation: New data, new tools and a new generation of scholars. Respect: Towards various religions, towards the past and the future. Enrichment: Research, digital access, international collaboration. Religious studies is a promising field of research, which is becoming ever more crucial today due to the impact it has on the understanding of social, political, economic and cultural processes and of changes in European society and in the global equilibrium. The development of this domain requires the collecting of a large set of data and knowledge, which no existing individual facility is currently capable of providing. ReIReS grants access to the data and metadata needed in order to develop ground-breaking research in historical religious studies. Integrating national Research Infrastructures into a unique European RI on historical religious studies. ReIReS is creating an integrated system of sources, resources and facilities, both single-sited and distributed, combined with support in the acquisition of adequate practice and expertise in managing the whole set of research instruments provided by the starting community. Supporting research activities in this manner, the starting community builds a RI that effectively prepares the future of European society by delving into the past of its religious history. ReIReS involves digital research platforms, infrastructures, universities, academic networks and stakeholders from seven European countries: Italy, Germany, Belgium, Netherlands, France, Bulgaria and Poland. These institutions share their existing sources, tools and facilities, integrating them into a system of transnational access. In a second stage, the consortium looks for collaboration and interaction with other institutions. Shaping a promising field of research in a multidisciplinary perspective. Scientific interest in religious issues involves various disciplines: philosophy, sociology, anthropology, legal and political studies, economics, literary studies and theology. With respect to this plurality, it is up to historical studies to offer a comprehensive and integrated framework for the development of a larger and more detailed understanding of religion. ReIReS considers the historical approach to religion as its proper scholarly perspective for the purpose of dealing with religion and its complexity, and for the sake of organizing and managing the huge amount of data required for research activities in this domain. It is only by considering religion as a phenomenon impacting the whole of humanity, both on the social-structural and the personal level, that it is possible to develop innovative and groundbreaking research capable of embracing the contribution of various disciplines, combining different methodological approaches and adequately using different sources. Creating an international research community within a more and more unified Europe. The need to develop a larger and more comprehensive understanding of religion in a historical perspective requires a significant evolution in the epistemological approach to this kind of research. The core mission of ReIReS therefore is to support: (1) the development of new attitudes in this domain, (2) effective innovation in the methodologies of research, (3) a stronger connection among scholars engaged in religious studies, and consequently the promotion of the creation of a veritable academic community of religious studies. Training a new generation of scholars. As a starting community, ReIReS seeks to effectively establish interdisciplinary collaboration and to share research tools and results among its partners, creating an adequate intellectual framework for the growth and training of future generations of scholars. In fact, the RI offers to its users, particularly to young scholars, the possibility of developing their research-driven skills by becoming acquainted with new research methodologies and by mastering a plurality of fields of expertise and sources. Research as service to the community. Historical religious studies are a crucial instrument that enables European public institutions and civil society to face the current period of crisis. ReIReS offers a comprehensive perspective for understanding events such as (sometimes violent) conflicts, social and political changes or crises. ReIReS, in supporting the development and implementation of innovative research in the domain, also grants access services to the community. The results of the research projects that make use of the RI directly impact on the European capability to create a strategic narrative concerning our contemporary societies and cultures. Defining a discipline. By sharing expertise, combining tools and skills, managing exchange of staff supporting relevant research projects and, last but not least, by broadening their scope through effective and efficient academic interaction, ReIReS reframes historical-religious studies at the European level. Young scholars grow within this innovative perspective, which involves the sense of belonging to a European academic community. The growth of a new generation of scholars. ReIReS creates the conditions according to which the studies and researches dedicated to the plural fields of religious studies are recognised as part of a common and consistent academic domain. The RI offers the opportunity for prominent scholars and young researchers to meet each other and to cooperate in common activities and projects, enabling the development of personal academic skills. For this reason, one of the main pillars of the research policy embraced by ReIReS is the creation of an effective programme of networking activities involving both research and administrative staff of the members of the starting community. Innovation and high quality standards. A significant objective of ReIReS concerns also the quality, structure and condition of research in the field of historical religious studies. The RI grants the possibility of developing this kind of study in a truly academic and thus independent way, by transcending the particular expectations of religious communities or the often rather restricted need of political, social, and economic institutions. Precisely because of the effective exercise of this freedom of academic research, ReIReS offers groundbreaking results in terms of the advancement of knowledge in religious studies (see WP3 and WP4) and in doing so it offers an innovative contribution also as a service to the community. Towards the awareness of the public role of religions. The dissemination of the results (see WP8) achieved so far by using the facilities offered by the RI impacts deeply on the development of a more underpinned understanding of the role of religion within our society, supporting the activities of subjects such as policy makers, teachers, health workers, or opinion makers. In addition, the dissemination of the results provided by ReIReS impacts on the practice of social choices, since this RI concerns the understanding of a significant set of values consistent with the life of many European citizens as well as of people in strategic areas of the globe. The religious perspective, in fact, influences key-issues for the development of effective policies of social inclusion and social innovation such as gender or ethical matters. Religion contributes in shaping a set of individual values as well as of common principles shared by a society, and thus it influences the construction of social habits, consensus building processes, systems of governance, and decision-making processes. Research activity as a service to the community. ReIReS makes it possible for the European research system to deal with the complex and varied panoramas of religion and religious phenomena by means of a comprehensive scholarly perspective that combines major acknowledged expertise and resources to support research activities. This gives the EU a leading position in this domain, creating within Europe a RI that develops new approaches to the topic of religious studies and establishes a consistent and recognisable field of studies. The research infrastructure intends to bring results both within and outside of academia. In this perspective, the final objective of ReIReS is to have an impact on sectors such as education, public service and the advancement of knowledge and technology. ReIReS joints research activities of the partners, integrating complementary scientific skills and capabilities, and it organizes networking activities for fostering a culture of co-operation between national research facilities, scientific communities, and other stakeholders including policy makers. ReIReS creates a synergy between the partners, offering a transnational and virtual access to the most significant tools and sources in the field of religious studies. This grants to the research communities the use of the major tools joint within a comprehensive infrastructure and gives to the EU a leading role in a domain, which is becoming more and more crucial for the understanding of inter-cultural dynamics and facing conflicts of our time. Dealing with the need for an appropriate comprehension of a complex and multicultural society, ReIReS consortium works towards the improvement of the integrated services of the partners. It aims to establish a distributed RI with a sustainable plan of activities, including offering access to a wide range of high-level data and tools for advancing knowledge and innovation in the understanding of multi-religious society. Why is ReIReS Important for Society? ReIReS deals with the matters and need of a plural and multicultural society in which religious, philosophical and non-confessional identities of individuals and communities have a crucial relevance. ReIReS’s combination of tools, sources and expertise offers to the referents of these public institutions effective instruments to deal with a clear understanding of the complexity and implication of this religious situation, of its long-term historical roots and of its deep connection with cultural, political, economic, and social history. In fact, the project achieves innovative results in as far as they become the basis for the development of interreligious dialogue and for the growth of the self-consciousness of the communities and organisations and of their contribution to the implementation of practices of social cohesion and integration. The partners that join the starting community ReIReS are all well experienced in European projects and in their management. However, due to the complexity and variety of the activities provided by the consortium, the international dimension of the project, the kind of actions and the number and diversity of the partners involved, it is necessary to establish and implement a solid and efficient management structure. This visual representation shows the whole structure of governance of the consortium. 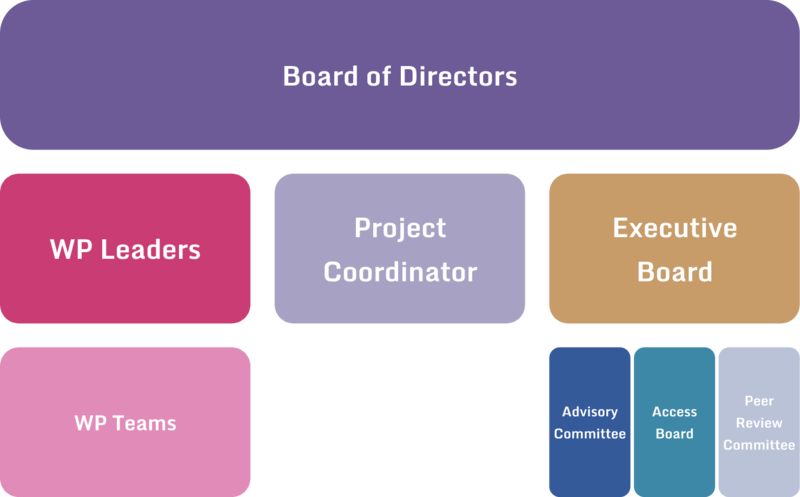 ReIReS has following decision-making bodies: the Board of Directors, composed by the directors of each partner institution of the consortium or by a fully authorised representative of them; the leader of the project. The advisory bodies of ReIReS are: the Advisory Committee, the Access Board, and the Peer Review Committee. The Executive Board is the supervisory body of the execution of the project: it coordinates the horizontal as well as the vertical activities of ReIReS in order to establish and implement the project and to grant the fulfilment of the expected results and impacts. The Project Coordinator is the leader of FSCIRE team and leads the project. Finally, ReIReS provides nine integrated actions, or work packages (WPs), which are the basic element of the entire project. Each WP involves a WP team and a WP leader. Go here to read more about the nine work packages. Horizon 2020 is the biggest EU Research and Innovation programme ever with nearly €80 billion of funding available over 7 years (2014 to 2020) – in addition to the private investment that this money will attract. By coupling research and innovation, Horizon 2020 is helping to achieve this with its emphasis on excellent science, industrial leadership and tackling societal challenges. The goal is to ensure Europe produces world-class science, removes barriers to innovation and makes it easier for the public and private sectors to work together in delivering innovation.